Maurycy Gottlieb ( Polish pronunciation ; February 21/28, 1856 – July 17, 1879) was a Polish Jewish realist painter of the Romantic period. He was born in Drohobych to a wealthy, Yiddish and Polish-speaking orthodox Jewish family living in Galicia. It was then part of the Austrian sector of Partitioned Poland, now Western Ukraine. Considered one of the most talented students of Jan Matejko, Gottllieb died at the age of 23. 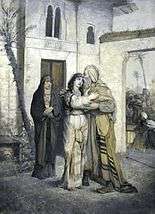 Maurycy (Moses) was one of Isaac Gottlieb and Fanya née Tigerman's eleven children. He was introduced to painting in Lemberg (Lviv) by Michał Godlewski. At fifteen, he enrolled at the Vienna Fine Arts Academy for three years. In 1873 he went to Kraków to study under Jan Matejko and became close friends with Jacek Malczewski. However, an anti-semitic incident at the School of Fine Arts prompted him to leave Kraków after less than a year in spite of Malczewski's protests. He traveled to Norway and stayed in Molde. He returned to Vienna and from there travelled to Munich in 1875 to study under Karl Piloty and Alexander Wagner. 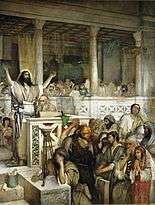 In 1876 he won the Gold Medal at the Munich Academy for his painting, Shylock and Jessica. In the same year, he moved back to Vienna to attend the workshop of Heinrich von Angeli. He lived and worked in Vienna for the next two years and produced paintings with biblical themes, as well as illustrations for Friedrich Bruckmann Publishing of Munich. In the fall of 1878, Gottlieb travelled to Rome, where he befriended Henryk Siemiradzki. At a banquet in his residence at Via Gaeta, Gottlieb met with Matejko, who convinced him to come back to Kraków as one of his best students, to work on a series of monumental paintings including scenes from the history of the Jews in Poland. In 1879 Gottlieb settled in Kraków and began working on his new major project. He died in the same year from health complications. Matejko attended his funeral and promised his father to look after his younger brother Marcin. Gottlieb won a gold medal at the Munich art competition for his painting, Shylock and Jessica (1876), portraying a scene from Shakespeare's The Merchant of Venice. The painting was exhibited in Lviv in 1877, and in 1878 at Zachęta in Warsaw and widely acclaimed. Gottlieb based Jessica's face on that of Laura Rosenfeld (see Laura Henschel-Rosenfeld), to whom he had proposed marriage. However, Laura rejected his proposal and wed a Berlin banker. Gottlieb planned to marry Lola Rosengarten, but when he heard about Rosenfeld's marriage, he knowingly exposed himself to the elements, dying of complications from a cold and sore throat. Despite his premature death at the age of 23, more than three hundred of his works survive (mostly sketches, but also oil paintings), though not all are finished. After the fall of the Iron Curtain, many Polish collections unknown in the West were popularized, and his reputation grew greatly. His brother Leopold Gottlieb was born five years after his death and became known as a painter as an adult. 1 2 "Gottlieb, Maurycy". Malarstwo, Europa. Encyklopedia WIEM. Retrieved November 23, 2012. 1 2 3 "Maurycy (Moses) Gottlieb, Drohobycz 1856 - Kraków 1879" (in Polish). Pinakoteka Zascianek.pl. Retrieved November 19, 2012. 1 2 3 Ewa Micke-Broniarek. 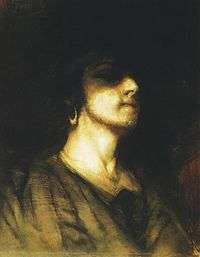 "Maurycy Gottlieb" (in Polish). Adam Mickiewicz Institute Culture.pl. Retrieved November 19, 2012. ↑ Ezra Mendelsohn, "See: Letter of Maurycy's father, Isak Gottlieb, in Der Israelit, No. 15, 8 August, 1879", Art and Jewish–Polish Relations: Matejko and Gottlieb at the National Museum in Warsaw, Central European University. Public Lecture Series. Małaszewska, Wanda (1996). "Gottlieb, Maurycy". In Jane Turner. The Dictionary of Art. 13. Macmillan Publishers Limited. pp. 215–6. ISBN 1-884446-00-0. Nehama Guralnik: In the Flower of Youth: Maurycy Gottlieb. Tel Aviv Museum of Art, Dvir Publishers, 1991. Wikimedia Commons has media related to Maurycy Gottlieb. Jews Praying in the Synagogue on Yom Kippur, in Poem for Rent project.